Thank you all so much for coming out and supporting our third year. Thank especially to everyone at Verdugo bar for hosting and for all of your hard work. AND to all of our rad volunteers for donating your time to make sure our event ran smoothly. Remember…. You can still get your hands on our newest beer “THREES”, a Rye American Strong Ale, in the taproom on draft or in bottles to take home and enjoy. So don’t worry if you missed the party; you can still pick up a bottle and celebrate at home! Lucky Baldwins British Pub & Cafe was opened in July 1996 by English owners David Farnworth and Peggy Simonian, who turned a run down business into the beer haven it is today. it is located in the heart of Old Town Pasadena, in one of the oldest buildings in town. Lucky Baldwins Delirium Pub was opened in 2005, in the quaint village-like town of Sierra Madre up in the foothills. With 63 beers on tap in Pasadena Old Town and 46 beers on tap in Sierra Madre, the pub offers an array of unique beers, both bottled and tap. Throughout the year Lucky Baldwins also celebrates European drinking festivals, such as our renowned Belgian Beer Festival, IPA festivals, Octoberfest and the list goes on, placing Lucky Baldwins in the top five Belgian beer bars in the US. And now onto the main event! We started the night off with Tripel Karmeliet from Bouwerij Bosteels. At 8.4% this recipe uses three kinds of grain and was a great kick off for our night! The second pleasure on our flight was Biere de Beloeil from Brasserie Dupont. This strong Belgian Pale Ale is composed of FIVE different malts and has a substantial hop character for a Belgian-style beer. It rolls in on the charts at 8.5% which was just a touch higher than our first taste. 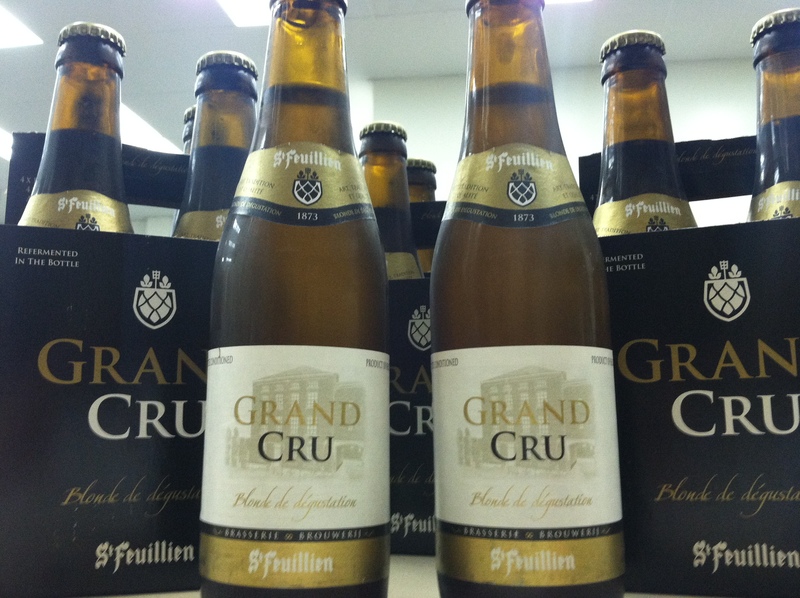 Third in line for the tasty divine, was Grand Cru by Brasserie St. Fuillen. As one of the more recognizable beers on the flight, Cru is an extra-blond Belgian Ale that has no spice added and intense hop bitterness compared to the other Belgians in our list. At 9.5% ABV you can definitely ensure us ladies were feeling happy by this point in our night. After the enjoyment of the Cru we moved onward in order to delight in the fourth beer of choice. 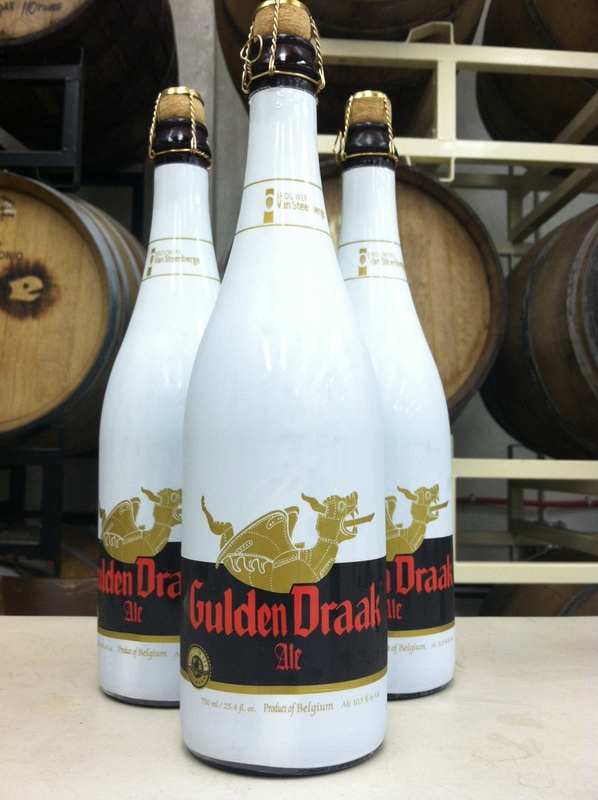 Gulden Draak by Brouwerij van Steenberge when translated, means, Golden Dragon, and was named for a gilded statue on top of the Belfry in Ghent. 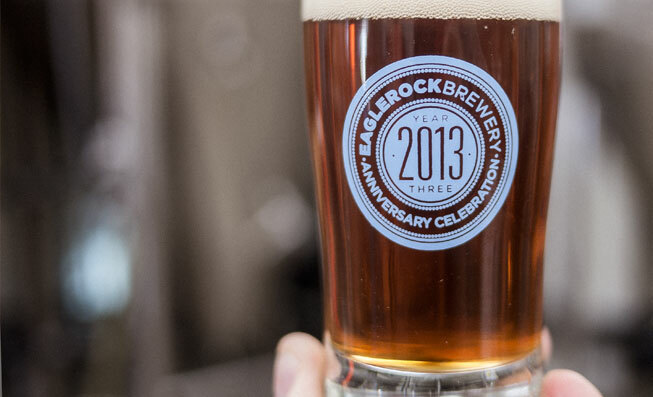 This dark triple has flavors of caramel, roasted malt, and coffee and rolls in at 10.5%. 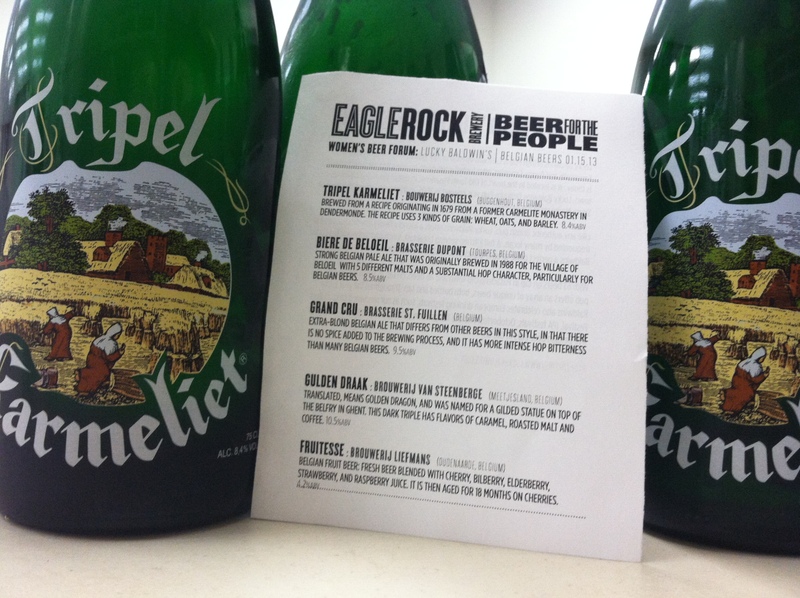 And finally we’ve reached the end of our Belgian beer journey with a sweet final finish. 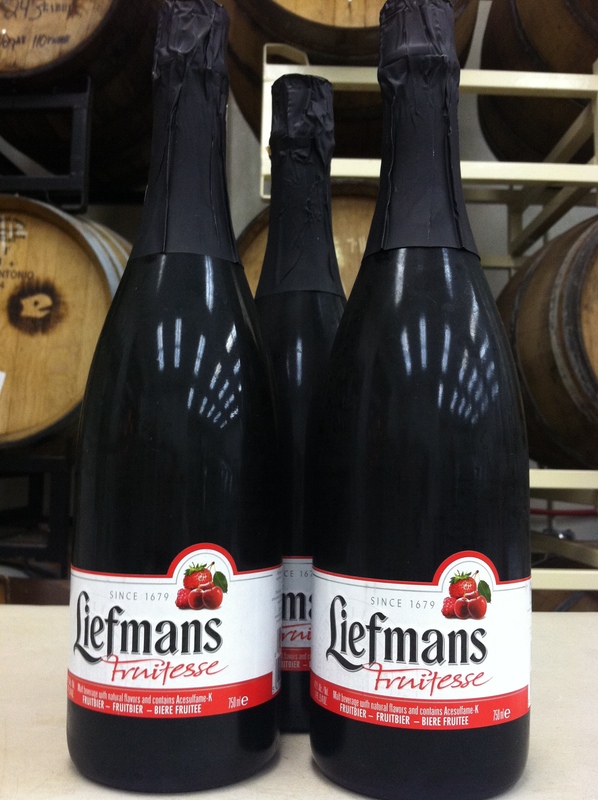 Fruitesse by Brouwerij Liefmans is a Belgian fruit beer: beer blended with cherry, bilberry, elderberry, strawberry and raspberry juices. It is then aged for 18 months on cherries. At just 4.2%, it was the perfect final note to our flight and had just the right touch of fruity with a hint of sweetness. It was such a fantastic night with so much great insight from the lovely Peggy Simonian. 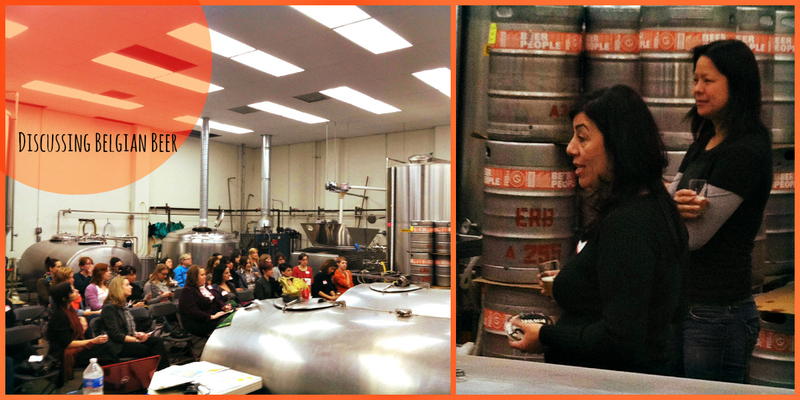 Thanks again to the ladies from Lucky’s for coming out, drinking with us and sharing your awesome company/knowledge. And again thanks also to Taylor from Steel City Sandwiches for feeding us despite truck challenges earlier in the week. You rock! Ting Su and Peggy Simonian. To find out more about upcoming Women’s forum events; visit our website. With so many choices of beer out there now; it can sometimes seem a little overwhelming to know what to try. If you’ve ever been to our taproom you know that not only do we offer take-home growlers for purchase and fills of our tasty beer but we also have a bottle fridge filled with our core brews, specialty bottles and many other options from breweries that we love. But when faced with an array of choices such as this…. how does one decide? You can always ask the staff for their opinions as most of us have tried just about every bottle in that fridge or you can check out our “Staff pick”. The staff pick will be a bottle that someone on our staff is really loving this month and wants you to try too. It’s kind of going to be the easy pick, so to say, of a beer that is either new and exciting or classic and delicious for you to grab and take home to enjoy as well. Each pick will be labeled with the name of the staff member who chose it so if you happen to have any questions or want to know why they chose that particular beer; you’ll know who to ask! We decided to kick this first month off with a bottle chosen by the first lady herself; Ting. 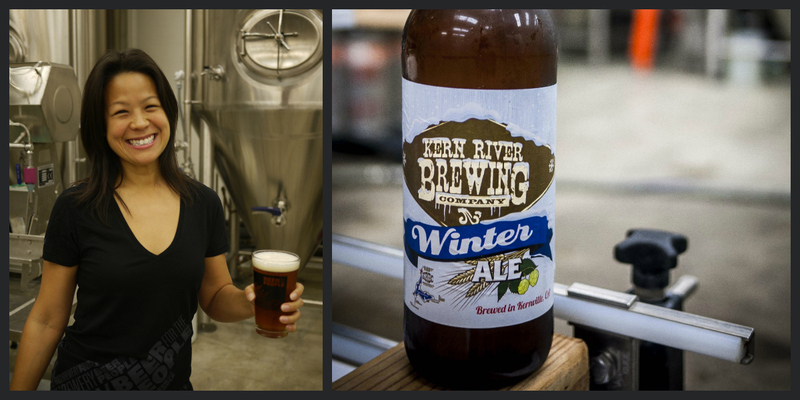 Ting chose Kern River Brewing Company’s “Winter Ale”. Described on their site as, “A spicy rye Winter Ale that gets its kick from rye but has plenty of hops to balance out the malt”. Ting describes her choice as, “clean, well-balanced and hoppy. The hop character is a nice deviation from standard winter beers, which tend to be more sweet”. 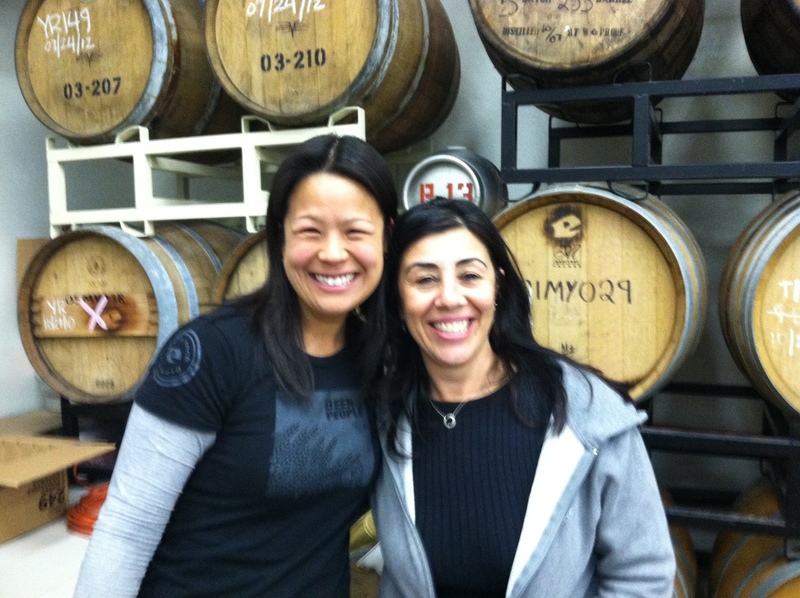 Women’s Beer Forum: Belgian beers, Lucky Baldwins Style! Happy New Year! It’s been another exciting year and we’re gonna keep the ball rolling with another amazing guest speaker. I’m super excited for you all to meet Peggy Simonian! Peggy is the owner of all three of the Lucky Baldwins Pub locations, where they have led the pack in featuring great beers and popularizing specialty beer pubs in the Los Angeles area. She has played a large role in the introduction of Belgian beers to Los Angeles, and has been one of the first ladies of LA’s beer culture since the 1990s. For this flight, Peggy will discuss 5 of her favorite Belgian ales and share some amazing insight and fun stories on these beers. You don’t wanna miss this, because I don’t know when you’d get another chance to get to hang out with Peggy and taste this fabulous flight! The date of the event will be on Wednesday 1/16/13 and will run from 7p-9p. The cost of the flight will be $20 and will include tastings of 5 fantastic Belgian ales, a flight sheet, some QT with your favorite girlfriends, and a rare opportunity to talk beer with a great lady who has been at the forefront of contemporary Los Angeles beer culture since it’s beginnings. Please RSVP so that we are sure to have enough beer on hand. Looking forward to seeing you all at the forum! It’s happened. We made it to 3 years. Whoot! And as usual we are celebrating in style with a big bang. The great folks over at Verdugo Bar will be hosting our party again this year on January 26th from 12-4pm. The cost will be $15/person which includes 2 drinks and a commemorative glass to take home. More drink tickets will be available for purchase. Mandoline Grill and more will be there to feed you and with a total tap takeover we will be serving 22 of our beers to celebrate this third year; including our newest member “Threes”— a Rye American Strong Ale brewed specially for the occasion. Are you excited yet? We are. How about a peek at the tap-list for the day? And a few other surprises. You’ll definitely want to be there so be sure to put this one on your calendar now! And add a reminder alert. Because you are not going to want to forget. The beer gods will not be pleased. 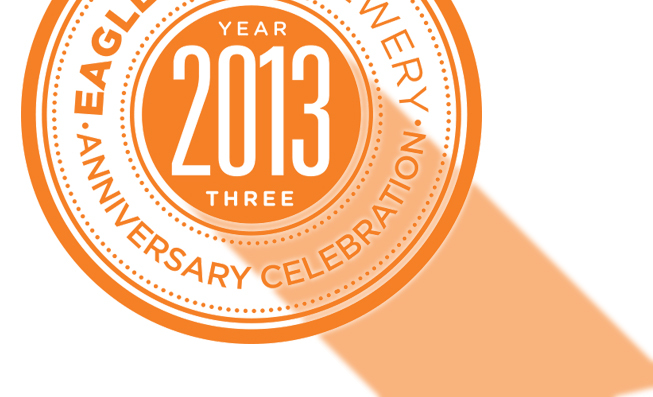 And a special thanks to each and every person that helped us get to year 3. Whether it be through beer drank, swag bought, volunteering, special hugs, incredible favors, never-ending support, dance parties, laughter, ginger-jokes….. anything….. we are so grateful and love you all.